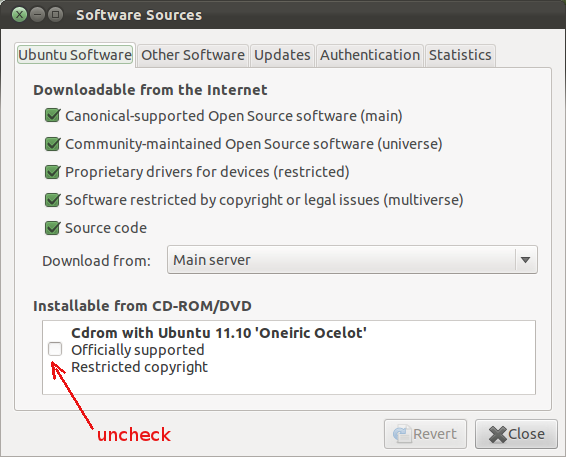 Run "Software & Updates" and uncheck checkbox near "Cdrom with Ubuntu"
Remove any lines that include CD-ROM. Save the file and try once more. The W: lines are warnings. The first one is because you still have your install CD (the one you used to install Ubuntu in the first place) listed as a possible software source, but it is not in your drive at this time (reasonable, ignore it). The second is because you have copied a URL (web address) verbatim and not changed your_ubuntu_version to the name of your Ubuntu version. It should read http://ppa.launchpad.net/synce/ubuntu/dists/oneiric/main/source/Sources instead, since you're using Oneiric Ocelot (11.10). It is trying to use the repositories on the CD you used to install Ubuntu but cannot access them (potentially because the CD is not in the drive). Assuming that you have an internet connection that you can use for installing new software (and updates) you can safely disable the repositories on the CD. Hit Alt+F2 then type gksudo software-properties-gtk and enter your password in the dialogue that comes up. Now in the window that comes up you should be able to disable using the cdrom repositories by unchecking them in either the bottom of the "Ubuntu Software tab" or in the "Other software tab" (most likely in the former location). Hope this helps. You have selected the CD-ROM as software sources, so it is checking the CD-ROM for the source. Sounds to me like you have your update manager looking for updates on the installation CD. I would suggest installing Synaptic if it's not already installed and then using that to take a look at your software sources. then Load Synaptic Look for Settings > Repositories in the menu. Problem in apt-get update - Ubuntu 12.04?